He ya! I’m Elena and I write about healthy veggie (and vegan!) recipes and outdoors activities over at The Healthy Veggie, but today I’m guest posting for my lovely ex-workmate and banter buddy Haydy. Having just moved to Manchester, I was invited to a chocolate making workshop at Copthorne Hotel Manchester, in Salford Quays. Haydy was helping out with the event with the rest of the Joe Blogs Team (I miss you guys!). Millennium Hotels wanted to celebrate the 10th anniversary of Tim Burton’s Charlie And The Chocolate Factory movie adaptation by making our own chocolate… what an excellent way to celebrate! The evening started with an introduction to the history of chocolate, which was very interesting. I had no idea it dated back to the Aztec era! Apparently the Aztecs drank a luxury beverage made from cocoa beans and chilli. It was then Christopher Columbus who brought the beans to Europe, but he didn’t recognise their value. Rookie mistake, good ol’ Chris. It wasn’t until the 1600s that the chocolate craze reached the UK. It’s a bit weird to think about it, isn’t it? Hard to imagine life without chocolate. Organic dark chocolate gets me through lots of sweet cravings and allows me to avoid having a super unhealthy binge. We were then talked through the chocolate making process and had a chance to hold a cocoa pod as well as some slippery cocoa butter. It was nice to understand how exactly the delicious substance is made, from seed to bar. Things started to get yummier once we did some chocolate tasting. After a very bitter taste of cracked cocoa beans, we were presented with four different chocolate drops. From healthier 95% cocoa chocolate to and cheap and waxy chocolate, the drops helped us develop a chocolate palate. Then, we were allowed to play! 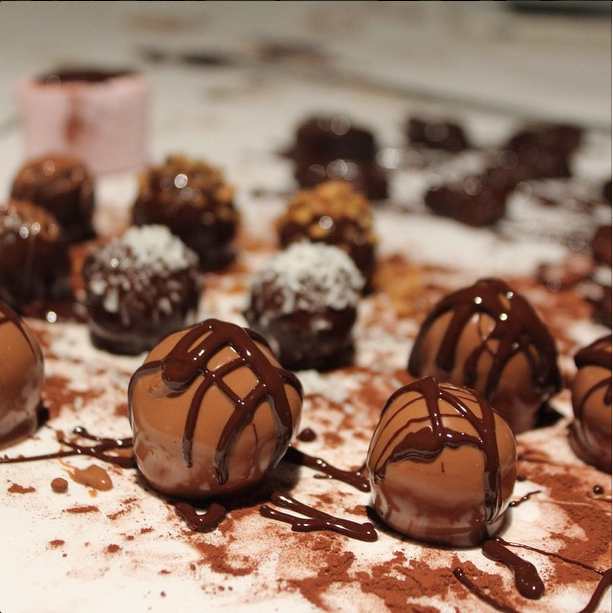 First, we made our own chocolate buttons, then we prepared some truffles. Working the piping bag, I felt like a real pâtissier… For a second. My truffles looked like little dog poops (I reckon a Chihuahua kinda size). I’d (mercifully) have a chance to fix them later. Phew. Whilst we waited for the truffles to set, we cut and decorated some chocolate fudge. I have to admit, only ¾ of it made it home… It was delicious! Finally, we dipped the truffles in chocolate and decorated them. Before leaving, we packed our creations and took them home. I grinned all the way home – I thought I had a month’s worth supply of chocolate. Of course, my boyfriend unapologetically ate most of it the next day. It was a great and delicious evening, made even nicer by the lovely group of bloggers who participated and the incredible Joe Blogs team. Millennium have written about the event and the best UK chocolate experiences here. Go check it out. "Diamond Supply’s First Summer Drop…"